Interested in using a dehydrator like mine to dry your own foods to make many yummy things including your own dried soup mixes? You can hover over the picture above to be taken directly to the LEM website to buy it! We live on the outskirts of our city and I like to call myself a homesteading wannabe. I have grown a garden on half of our property for ten years now, each year it gets bigger and better. This year we finally added in a backyard chicken coop and we collect fresh eggs daily. Someday soon we will move further out into the country but until then I make due. All that gardening means we end up with more produce than we can eat fresh or give away. I enjoy canning a lot of it and also dehydrating a lot. Preserving all my hard work is my number one priority. Take for instance this summer, I grew over 200 lbs of tomatoes! I canned most of them and then took about 15 lbs and dehydrated them. Dehydrating intensifies flavors, it is amazing. Did you know that you can dehydrate lean meat? Every couple of years my parents purchase two steer to raise and have butchered. Hereford are wonderful for grass fed meat. You just cannot buy that in the store. I am so thankful that they share some with my family. My husband and family members also hunt for deer every year. If we are lucky enough to get our hands on some venison I will preserve that too. I dehydrate quite a bit of meat (and make jerky) and pressure can as much as I have time for. Red meat is definitely a staple in our home. I have approximately 60 different dehydrated goods in my pantry and they really come in handy. Dehydrated food will last a long time if stored right, that's why I love it so much. If the power happens to go out I know my food in jars will be there even when the freezer goes out. I really enjoy using my new Mighty Bite® Dehydrator from the LEM website. It is whisper quiet, has a digital timer, the temperature stays true, and it has a rear mounted fan for faster drying times. 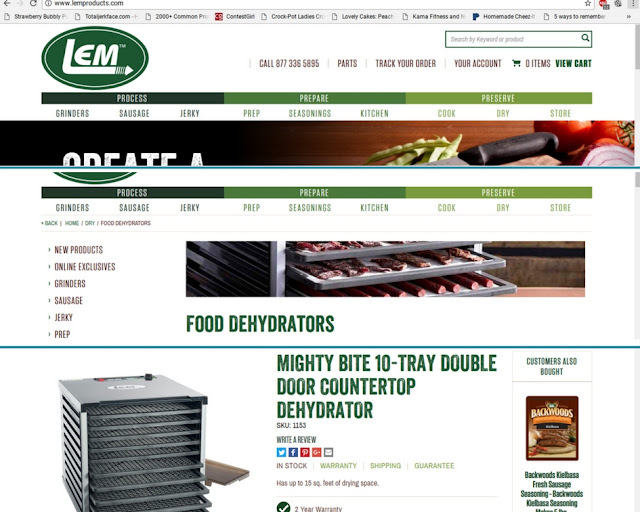 I found my Mighty Bite® 10 Tray Double Door Countertop Dehydrator at LEM under the Preserve tab where it says Dry. There are also Big Bite® versions that are stainless steel for large capacity and durability. My favorite way to use all my dehydrated goods is in soup. It's actually a lot of fun because I fill canning jars with my mixes (which looks so pretty) and it's a quick supper. A huge plus is that I know exactly what goes into it. My husband loves taking my dried goods with him to deer camp, dried soup mixes are the perfect hunting and camping meal. Below I'll be sharing one of our most favorite dried soup mix recipes! Tip: The kids all love to help me lay out the food to be dehydrated on the drying racks, it's fun to get them involved. FYI: I dehydrated everything for my recipe at 145 F for 8 hours. I put them all together at once and the results were awesome! I always freeze my items in air tight bags or containers for 4 days after drying, just to be sure they are 100% safe. After 4 days I take them out and let them sit another day to come to room temp and then I will vacuum seal into jars. For more info on how to properly dehydrate please refer to your dehydrating manual or guide. 1 cup dried ground beef or venison (all fat must be drained off before dehydrating, I do add salt and pepper here). I want to mention that I used our LEM Countertop Grinder to make quick work of the ground meat for this part! Put all into a jar (use a canning funnel) and label to be ready for use! I add a coffee filter under the lid ring to make it pretty. I do vacuum seal my mix in the jar before storing but it usually gets eaten within a month, nothing lasts long here! 4. Keep an eye on everything and stir often. Once everything looks well hydrated you are ready to enjoy! 5. I like to serve our soup with some shredded cheese and a little fresh parsley on top. It's a hearty soup that warms you from the inside out.